This blog post follows on from yesterdays as it’s one of the images from Dinas Bran (or Crow Crag) castle that I was talking about. 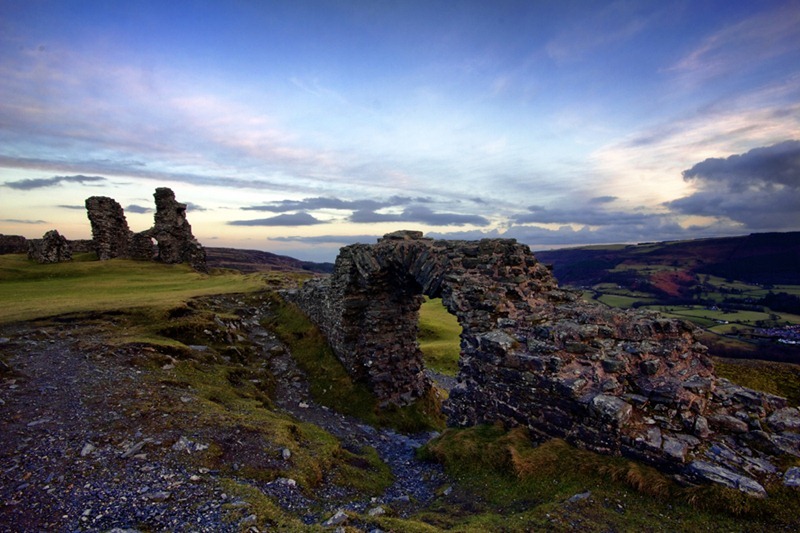 Obviously Dinas Bran is the Welsh, and original, name but I must admit to liking Crow Crag; I have no idea if the Welsh name translates directly to the English but either way is a great name for a castle, particularly one from the mid 13th century. 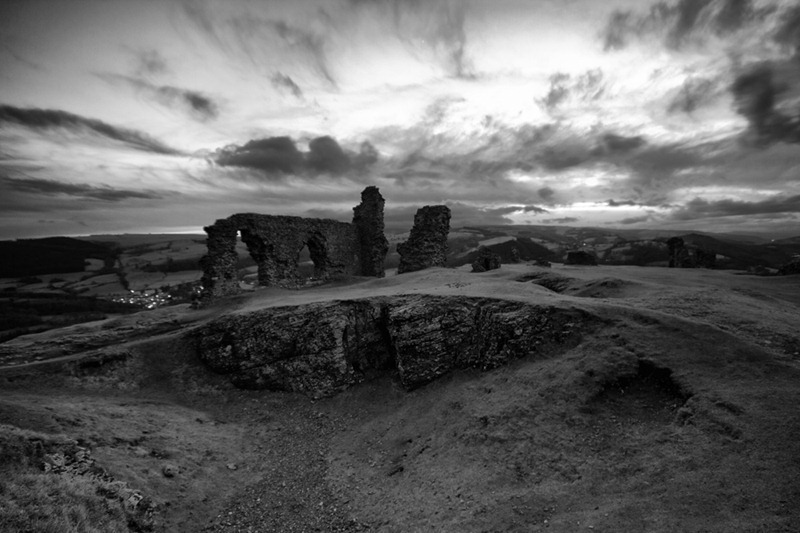 As I said in the blog yesterday I have attempted to photograph Dinas Bran before with limited success. After two attempts I now realise that this is one of those rare occasions when an overcast day or an early morning is required as the castle is so close to the mountains that the sun sets behind that the sunlight in the afternoon is harsh and unforgiving, even when compensating for exposure. This time I got to the top of the peak where the castle is late afternoon, around 3.30 pm; even then the sun was still going strong. Being a lovely day there was a lot of people up there – walkers and photographers – but I decided to hang around and wait until the sun had finally disappeared beyond the mountains. For a 13th century castle this fits quite nicely, as does its description as ‘poetic’. Dusk is a great word as well (and the name of a much underrated album by The The), although ‘twilight’ is now saddled with far more sillier baggage. It may be a while before anyone can use the word ‘twilight’ again without conjuring up the world of fey, grey, bloodless, sexless, six-packed vampires. As you know, it’s impossible for me to get too technical on this blog as I would quickly be exposed as not knowing what I am talking about but I would hope that it is now obvious to regular readers that you cannot take pictures in fading light without a) using a tripod or b) dialling the camera’s ISO number up really high. * For this image I used a tripod to ensure that no camera shake could be introduced and also so that I could shoot at a low ISO number. I do not have a particularly good tripod (that’s next on the list of expensive camera equipment I covet) but the cheap and cheerful one I do have is OK for the time being. So, believe it or not, this picture was taken in the dark, the exposure lasting 8 seconds. This is why it looks the way it does. 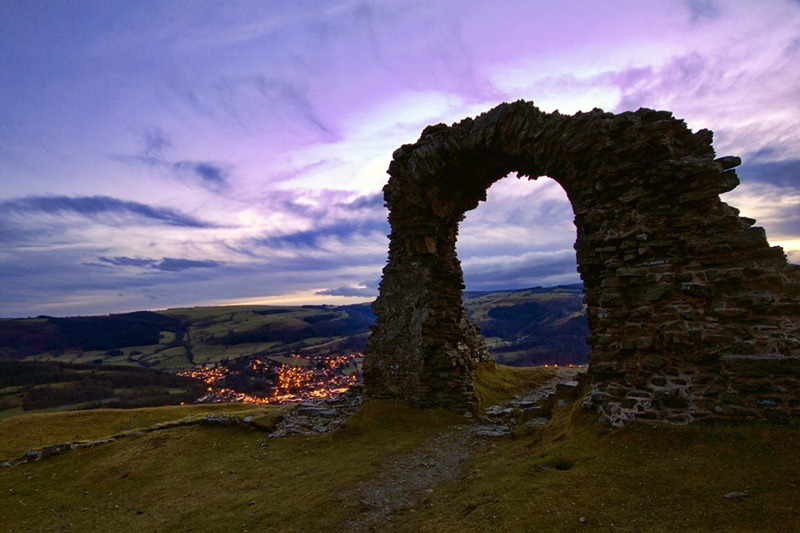 You can tell its dark as the street lights are on in the town of Llangollen below but the fading light has a really interesting effect on colours. The light hitting the camera sensor here is residual light still visible over the tops of the hills despite the sun having gone; in addition there is reflected moonlight – as I said yesterday the moon was out all day on Saturday and very, very bright despite only half of it being visible. The result of this is that the sky takes on those marvellous purple and blue tones and the grass is that mustardy green. This is the same technique I used to take my not-quite-award-winning picture of Chester cathedral. With that picture I just lucked out; I just happened to be there at exactly the right moment. This picture was planned and hopefully it shows. It also works marvellously well in black and white. *Technical bit: The ISO number indicates how fast a camera’s image sensor absorbs light. Therefore, in low light, increasing the ISO number will mean that the camera’s ability to absorb light in the dark is increased. But there is a payoff. Increased ISO means increased noise (grain) in your images because to take a picture in low light the shutter needs to stay open for longer and, therefore, the slightest motion results in image blur. Put simply, when hand-holding a camera if the subject of your picture moves when you are using a slow shutter speed then they will appear blurred (assuming that is that you manage to keep the camera stable). If you don’t manage to keep the camera stable when hand holding then the entire photo will be blurred (also referred to as camera shake). So increasing the ISO helps to protect against blur but the higher the ISO number the greater the noise. Modern DSLRs are getting better and better at reducing grain at high ISO numbers when hand holding the camera but if you want true image sharpness then a tripod is the only way to go. OK, so I know that in light of the New Year’s resolution that yesterday’s blog post was essentially cheating but hey it was still a post and since WordPress gave me the opportunity to share it with you I though what the hell. To be honest I was slightly taken aback that the blog’s health was in the ‘wow’ category, especially since it tailed off towards the end of last year. Still 12,000 visits is not too bad, even if a lot of visitors stumbled across it whilst looking for something else. I have now realised that giving a blog post a title that can be easily Googled is half the battle, so apologies to fans of the romantic comedy starring Nic Cage and Cher who might have found themselves here. The quote that heads up this blog post is from the song ‘Alan Bean’ by Hefner, one of the UK’s most underrated bands. I consider the now-defunct Hefner’s driving force Darren Hayman (now backed by The Secondary Modern) to be one of our finest songwriters and his 2010 album The Essex Arms was one of my top three albums of the year along with I am Kloot’s ‘The Sky at Night’ [another considered title for this blog post] and ‘High Violet’ by The National. So who is Alan Bean. As Hayman points out in the lyrics, Bean was the fourth man on the moon; an astronaut that few have heard of and many could not name. I mean after Armstrong and Aldrin how many of us begin to struggle? What makes Alan Bean special in Hayman’s eyes is that his trip to the moon with Apollo 12 was such a life-changing experience (and, let’s face it, it would be to any of us) that he has spent the years since he returned painting the moon. Bean figures that as he is one of the few that have actually been there then he is uniquely qualified to document this on canvas. As Wikipedia states ‘He is the only artist in the world to use real Moon dust on his paintings’. How cool is that? Given the task I have set myself for this year I am well aware that I may struggle taking a decent photograph every day. But it struck me recently that I had never attempted to take a picture of the moon. This picture, taken on a tripod with a 70-300mm zoom lens, was taken a couple of weeks ago during the UK’s descent into arctic conditions. Cold as it was the night sky was the clearest I have ever known it and given that the full moon looked so impressive I figured I’d give it a shot, telescope or no telescope. It took me a while. Trial and error and all that. The images I was getting were either too bright or too dark and it took me ages to achieve a shutter speed at which I could get the detail as seen above. 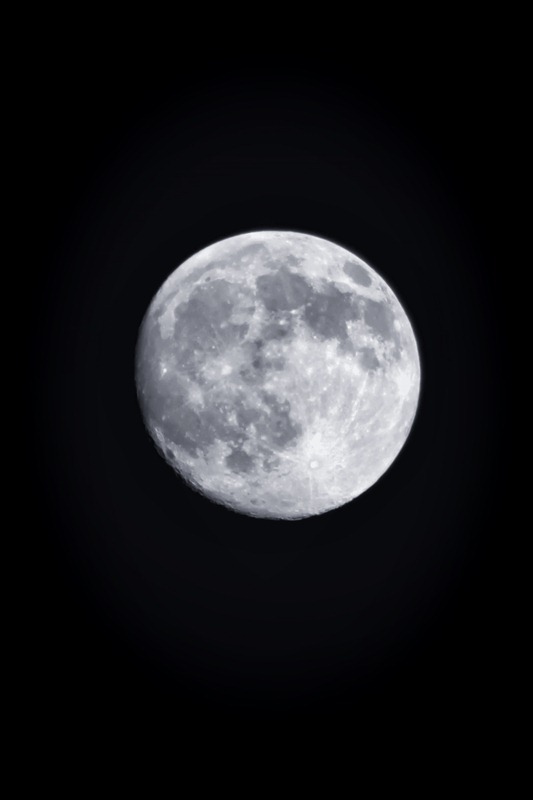 It amazes me that I was able to take a picture of the moon at all, let alone one where you can actually make stuff out. After all the moon is 238,855 miles away. The moon has always fascinated me and I think this is probably true of almost everyone on this planet. It’s always been there – probably formed when a Mars-sized object hit the earth and the debris aggregated in orbit to form the moon. It literally exerts a pull on us all, not only in terms of tides but also the approximate 70% of water that makes up our bodies. It has inspired folklore and literature and music for eons. Yet at the same time we take it for granted. It’s just there. I think that maybe it lost a little bit of its magic once Armstrong, Aldrin, Bean and co walked on its surface. Once you’ve been somewhere for the first time its mystique wears off right? I think that this is a bit of a shame. I can understand why we went but in real terms the lunar landings were akin to opening our front doors and making it as far as the doormat in the porch; As a technical feat it was ‘a giant leap for mankind’ but to find out it was not populated by H.G. Wells’ Selenites or made of cheese was a bit of a blow. And I don’t think the human race has ever recovered. The moon has become ordinary as science has taken us further and further into the heavens and we became aware of collapsing stars and dark matter and the magnitude of the space in which we hang. Yet the moon endures. I find its presence comforting and still marvel when it is full and shining. The phrase ‘moonlight’ evokes magic and romance and elicit activity. Tonight the BBC is launching ‘Stargazing Live’ with Professor Brian Cox and Dara O’Briain and I bet the moon doesn’t get a look in. OK, its not a star but it his our closest heavenly body and I think we should all raise a glass and toast its endurance. Next time the moon is full, take a long hard look at it and marvel. It really is quite wonderful isn’t it? 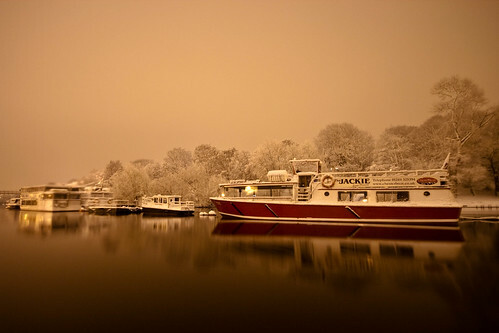 Ghost boats, originally uploaded by Zardoz67. This week is speeding by in a bit of a blur and I am having difficulty finding the time to slow down and enjoy the view. Not only am I extremely busy at ‘real’ work it’s also been quite hectic photography wise, what with the exhibition going up in Didsbury and my first proper photoshoot at Pinchjo’s tapas bar on Monday. To say I was nervous would be a bit of an understatement and so I had everything planned to the nth degree: extra memory cards, tripod, monopod, flash gun, etc, etc. However being the amateur that I am I forgot one vital piece of equipment (no, not the camera even I’m not THAT stupid). I forgot the attachment that screws the camera to the top of the tripod… Now when you are shooting inside a restaurant, at night, in subdued lighting this is a quite a problem. After 5 minutes of panic I calmed down enough to ask the Didsbury Life people if they had a tripod and could I borrow it. Thankfully, the answer was yes on both counts. The shoot went OK and some of the colours were pretty amazing but given that this was a commission I am not sure I should be blogging any of the images until Joe, the owner of the restaurant, has seen them. Thankfully, the restaurant was open only to a select invited gathering who knew they were there to be photographed so all was well (although I think the free [and gorgeous] food and proseco might have helped oil the wheels of conviviality). So, disaster narrowly avoided and another experience to tick off on the imaginary ‘things-a-photographer-should-do’ chart. I still have a load of pictures from the weekend to process which have sort have gone on the back burner in light of all the above. So today’s picture is from several weeks ago and is another one of the pictures I took on the river Dee in Chester, during January. So why this picture now? Primarily, at the moment, for its stillness and calming influence. I can shut my eyes and remember the conditions in which it was taken: early evening, heavy snow, total silence, on my own. Also, its another one of those pictures that has taken on a second life. I initially dismissed it out of hand but when I asked friends to suggest photos to include in the exhibition, this one kept coming up. Therefore, I revisited it and converted it to black and white; in fact the print that is hanging on the wall in Manchester now is the black and white version and it looks pretty good. This is the original version though and thanks to everyone who prompted me to go back to it. If I had to sum it up in a word it would probably be ‘ethereal’ and that would probably be the wrong word anyhow. That’s it for now but before I go a reminder that my small exhibition of pictures is currently hanging on the walls of the offices of Didsbury Life, 212 Burton Road, West Didsbury (opposite Folk bar). My photographs are being exhibited in the vicinity of a wonderful painting by a proper, talented artist, Lisa De Prudhoe. In order to raise money for the UNICEF effort in Haiti, this painting is to be raffled and can be seen here. Very soon you will be able to buy a virtual raffle ticket online – however, in the meantime, if you’re near to Didsbury you can buy a real raffle ticket from either Didsbury Life or the Wendy J Levy Art Gallery, Warburton Street, Didsbury Village, Manchester M20 6WA [0161 446 4880]. God light, originally uploaded by Zardoz67. OK, so my last post was quite divisive. Some people really liked the manipulated lighthouse picture (my wife included who is thinking of putting a print in the bathroom) and some people didn’t. Unfortunately, the ‘didn’t’ included a friend who is a professional photographer, his opinion being that spot colour should be illegal. Some you win, some you lose [secretly I still like it though but don’t tell him]. So I am stepping away from the digital paintbox today and heading back into the arena of pure, unadulterated photography. 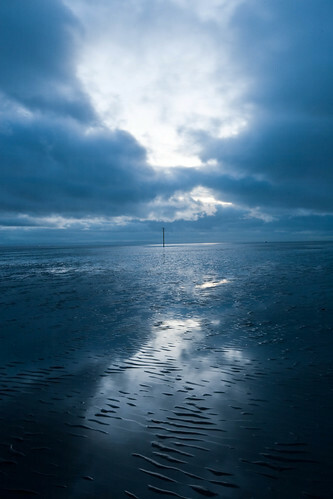 This picture was taken on Crosby beach, Merseyside during the same shoot as all the Anthony Gormley pictures. It serves to show that even though ‘Another Place’ is undoubtedly impressive it can’t hold a candle to the natural world. After working my way out from the shoreline to those statues that were only revealed when the tide went out it was a long walk back to where I parked the car. As it became too dark and my second camera battery began to reach critically low levels this brief break in the clouds let through some fading light and I was able to get this shot. In my opinion seascapes can be just as rewarding as landscapes and I really like this picture; certainly it’s composed quite well – the eye is drawn towards the light by the reflected clouds and the pole in the sand in the distance leads the eye out. Also, the light is great and although it’s not a particularly colourful image I do think it’s striking. Illuminess 1, originally uploaded by Zardoz67. I had a very good weekend photography wise this weekend and would go so far as to say that Sunday was the very first time I have actually felt like a proper photographer and that maybe the photos I took were among my best… But that is for later in the week as I have a couple of hundred photographs to sift through and process before I can share the results with you. Today’s picture though was taken on Saturday (5th December) at Ness Gardens on The Wirral. Lots of places like to do something special for Christmas from ice rinks to continental markets but this year Ness Gardens is doing something different. Ness is the botanical gardens of the University of Liverpool (where I was a student many moons ago) and has a wealth of exotic and indigenous flowers and plant life to discover, particularly in the Spring and Summer months. In fact, many of my flower pictures have been taken at Ness. 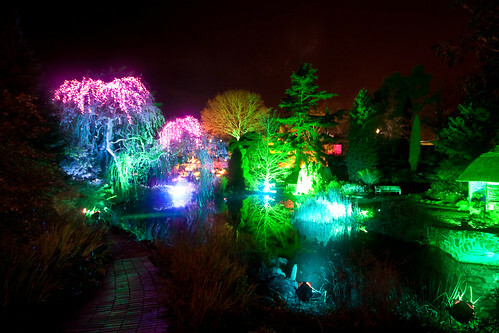 For Christmas this year (or rather from now until 13th December) Ness gardens is hosting ‘Illuminess’ (geddit), which is a night walk through the gardens that is strinkingly lit using coloured lights, lasers and searchlights. What’s more, all the lighting is solar powered so the whole thing is incredibly eco-friendly. Although baulking somewhat at the entry price (£15 for adults and £10 for children) I am really pleased that we went as the effect is truly stunning and totally unique. On entry, you follow a path around the whole gardens and at every there is something new discover from a maze of lights to dancing fairies to illuminated fountains to laser drawings in water spray. I could have stayed all night but with two kids in tow we went early (6.30 pm) and left about an hour and half later. The kids were enthralled, as were the adults, and I can’t recommend it enough. On Sunday I headed off to North Wales and ended up on a beach. In two and half hours I took several photos that I am incredibly proud of and I will be sharing some of these later in the week. But, in the meantime I hope you like the lights of Ness gardens. There are loads more photos on my Flickr stream. PS. For those of you in the North West, keep an eye out for the weather on NorthWest tonight. I have sent in a photo to provide a backdrop to Diane and Eno’s forecasting – if you see it please let me know! A strange fear gripped me, originally uploaded by Zardoz67. First post of December and its going to be a short one as it’s getting late. I took this photo on the way home from work this evening in the underpass where the runway for Manchester airport crosses the main dual carriage-way as you head out of Wilmslow. As you can probably tell it was taken with the 10-20mm wide-angle lens and I think this photo really highlights what the wide angle can give you and how it can enhance even the least colourful of photographs. Apologies if the picture is a bit Morrissey but I suppose it reflects my current mood in that I’ve been busy at work and the whole driving home in the dark and getting up in the dark really gets to me. Don’t think I have full-blown SAD (seasonally adjusted disorder?) yet as I do actually quite like the Winter – I like big coats and boots and scarves. I suppose this is also my second self portrait since starting the blog as the unidexter in the photograph is me. Anyhow, I think its turned out OK, if a little maudlin. Maybe it’s a sign of a new gritty urban direction but I doubt it, I have just been processing some Winter landscapes that I hope to share with you later in the week. No digital manipulation here. I suppose I could have removed the cycle lane symbol (are cycle lanes gritty and urban? Especially in Wilmslow) but I like the perspective that the wide angle gives and the shadows cast by the lighting. 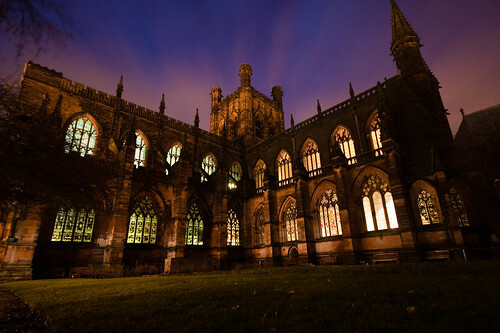 Chester Cathedral at night, originally uploaded by Zardoz67. Right then. Short blog post today as a) I am very busy and b) I think the photograph speaks for itself. Went out Saturday afternoon just as it was going dark – during what is known in photography circles as ‘the magic hour’ – to try and get some long exposures using a tripod and a timed shutter release. By sheer luck (it’s that serendipity again) I took this shot of Chester cathedral just at that point when the last light was vanishing from the night sky. This image has not been digitally enhanced in any way and that wonderful purple/pink sky is 100% natural capturing all the light over a 30 second exposure. Because it was early evening, the lights were still on in the cathedral itself as it was still open and this highlights the stained glass. It’s also pictures like this that make the investment in a wide angle lens worth all the money – without it I would not have been able to get all the cathedral in shot. 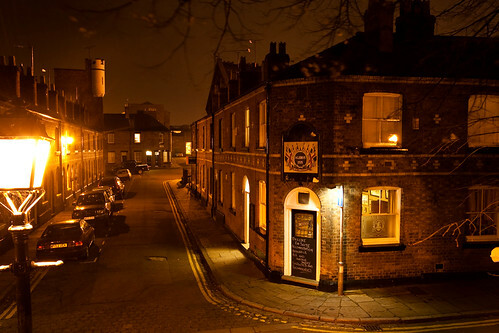 The Albion at night, originally uploaded by Zardoz67. Today’s photo is the second in an admittedly very loose series that I am calling ‘pubs at night’. Following on from my earlier photo of the Corn Mill in Lllangollen, here is another pub: The Albion in my home town of Chester. I probably should have posted this yesterday (for reasons that will become apparent) but since I didn’t take it until last night, that would have proved somewhat challenging. So why the Albion? Simply because it harks back to a different era and makes no apologies about it. On first glance (and this is a mistake that lots of Cestrians make) it seems to be quite unfriendly and unwelcoming. There is a blackboard outside declaring that it is ‘child unfriendly’, that it doesn’t want anyone under 25… or groups of lads… or groups of girls. It has no music, it has no TV, it only serves one type of lager (and this is under sufferance – the landlord titles his sole lager as ‘I can’t believe it’s not piss’). Sounds awful doesn’t it? Yet it isn’t… or at least to me it isn’t. Stepping into the Albion is like travelling back in time to the 1910s or more specifically the years 1914-1918 (hence why I should have posted yesterday). It’s decor does not appear to have changed since then and it’s walls are adorned with paraphernalia form the Great War – an image of Kitchener looks down from one wall, from another a poster urges you to sell your scape metal to aid the war effort. Occasionally, if you are lucky, someone will play the piano belting out ‘pack up your troubles’ or ‘it’s a long way to Tipperary’ . Again, sounds awful… but it isn’t. It’s a pub to go to with friends, to have intelligent discussion in front of the fire without being drowned out by music. A pub where no one fights and where you receive a genuine welcome (providing you are over 25 and don’t drink lager). A pub with a great selection of real ales and an even greater selection of whisky. It is a the original ‘local’ where regulars meet early doors and discuss the day’s events. And, in a world where our streets are dominated by vodka bars and Weatherspoons and neon palaces, it’s a haven. When I was young (i.e. during my formative drinking years) I used to hate the Albion – it was exclusive not inclusive, it didn’t want me or my mates within its walls so we weren’t going to honour it with our presence. As I have got older I have realised that what the Albion was really saying was ‘this isn’t for you, but it will be – see you in 20 years time’. I have a friend, Andy, who I see very rarely as he lives in Brazil, he often comments on my blog. This year he came over for one of his rare fleeting visits – just one Saturday night – and we spent a very enjoyable evening visiting old haunts in Liverpool. I waved goodbye to him on Sunday only to find him back on my doorstep an hour later after his train (the first connection in three) was cancelled. So, what to do on Sunday night? After a meal I suggested the Albion. Andy was initially dubious after reading (and laughing) about the blackboard outside but we spent a great night drinking good beer and (in Andy’s case) working through the single malts. At the end of the night, despite the fact that we were two of only about 10 people in the whole pub, Andy declared it ‘The Best Pub in the World’. And you know what? It just might be. 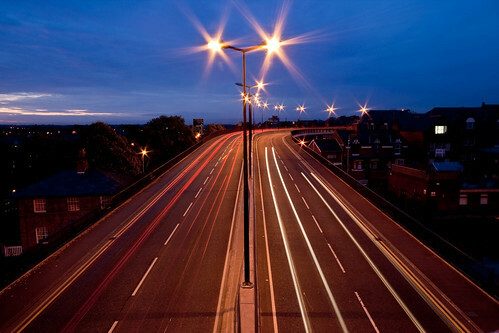 Carriageway lights, originally uploaded by Zardoz67. Hi all… Short post today as I am going away for the weekend to darkest Wales (Llandudno anyway). Camera all packed so I hope to get some good end-of-the-pier out-of-season pictures to share with you. Today’s picture is a long exposure (30 seconds at an aperture of f/22) taken at dusk as the light was fading from a wonderful pink sky taken on the City Walls in Chester where they cross the ring road that circles the city. Obviously, to achieve this effect (light trails from cards, star effect on street lamps) you need to use a tripod to keep the camera completely still and a timed shutter release to ensure that you don’r introduce camera shake when depressing the shutter button. Funnily enough when I took this photo I bumped into another amateur photographer who was doing the same thing. After a chat about our obsession we exchanged contact details with a view to maybe meeting up at a later date to take some photos. First time I have met a like-minded individual when out taking pictures and in general I have found other photographers to be genuinely supportive, certainly in terms of the images I have posted on-line and the contacts I have made on flickr. So a big thanks to anyone that has encouraged me. 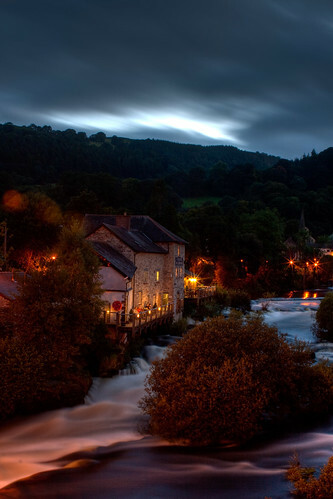 The Corn Mill (Llangollen) at night, originally uploaded by Zardoz67. There is an argument to be had that the pub is one of the greatest inventions ever to come out of the British Isles. Leaving aside the problems of alcohol addiction and the booze-fuelled violence that blights our city centres (yes, I know I shouldn’t but as a middle-class wine-drinker I can’t really point fingers and pontificate) can you imagine the UK without pubs? There’s something magical about a good pub, something that cannot be replicated by a flashy American-style bar or a French café. In many places up and down the British Isles, the local pub provides a focal point for the community. It’s not just about having a drink; it’s a place of human contact, a place where local news and gossip gets passed on, a place of community for the lonely, and a place of sanctuary for the put upon. Pubs now serve as the only live music venues for miles around, and as post offices, libraries and, since the smoking ban, places to eat (and eat very well!). Now I know that this all sounds a little bit rose-tinted and I know that for every character-filled village/country/town pub there are hundreds of chain pubs and modern chrome and glass bars. However, despite this I think that life does not much get much better than being in a good pub, with a decent pint and the company of friends. Rumour has it that the great British pub is dying; many are closing due to the introduction of the smoking ban (which as a non-smoker I am all in favour of), the credit crunch (people staying in rather than going out) and the rise of the supermarket. Many are being refurbished into the modern, trendy bars that now proliferate in our city centres just in order to survive. This is a crying shame. So what is my point? I’m not sure I have one. I certainly don’t have a solution to the current malaise. You could argue that lifting the smoking ban would help but I’ve had enough of smoke-filled pubs to last me a lifetime; you could pressurise the government to curb the supermarkets (which might also help with the binge drinking problem) but the supermarkets seem to be a law unto themselves driving prices down against each other and pressuring their suppliers to provide quicker and cheaper, whilst tying them in to exclusivity deals. In the meantime I think we should celebrate the great British pub for what it is. A ‘public house’ that opens its doors to all and, in many instances, forms a core part of the local community. All the above is preamble to today’s photograph, which (the more intelligent of you might have realised) is of a pub. This is another night photograph taken last week at the Llangollen hot air balloon festival. The pub in question is called The Corn Mill and sits on the banks of the river Dee with spectacular views of the river and the surrounding Welsh hills. I’ve had some pretty good feedback on this image both on Flickr and other forums so I thought I would share it with you via the blog. Hopefully looking at this image will distil the point I was trying (somewhat unsuccessfully) to make above.